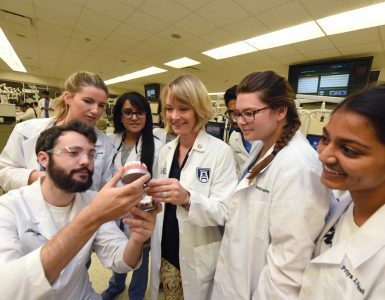 The Department of Oral Biology has merged with the Department of Oral Health and Diagnostic Sciences to become the Department of Oral Biology and Diagnostic Sciences. The merger helps integrate the DCG’s preclinical and clinical biomedical and diagnostic sciences and optimizes collaboration in education and research. 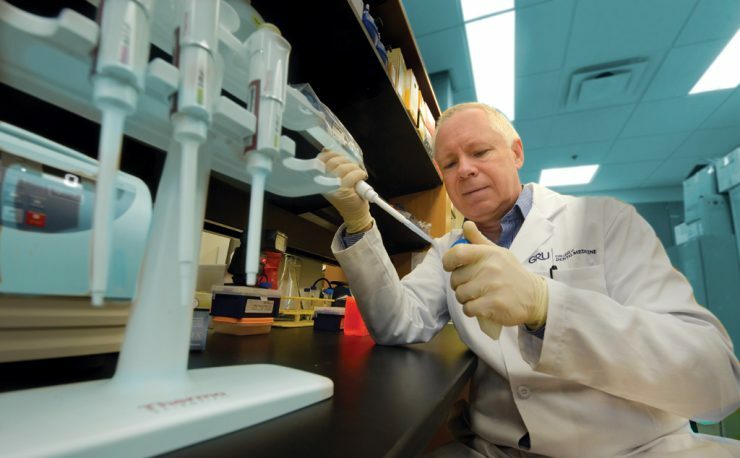 Dr. Andrew Yeudall (above), chairman of the department, earned degrees in biochemistry and dentistry from the University of Glasgow in Scotland and a PhD from the Beatson Institute for Cancer Research. Associate chairs are Drs. Allison Buchanan and Mahmood Mozaffari. Buchanan is a board-certified oral and maxillofacial radiologist who teaches at the pre-doctoral and advanced education levels and provides a referral service for cone beam computed tomography imaging. She received the 2017 Charles Craig National Teaching Award from Omicron Kappa Upsilon, the 2018 William H. Rollins Award for Research in Oral and Maxillofacial Radiology from the American Academy of Oral and Maxillofacial Radiology and a 2015 JAG20 Award from Augusta University recognizing excellence as an emerging alumni leader. Mozaffari joined the faculty in 1994 and is the teaching director for pharmacology and therapeutics curricula and is a member of the Integrated National Board Dental Examination Test Construction Committee. He also is a member of the American Dental Association’s Commission on Dental Accreditation, which appointed him a site visitor for 2018-19.
of student affairs. Young earned her dental degree from the DCG in 2006 and a master’s degree in educational psychology, applied cognition and development from the University of Georgia in 2018. 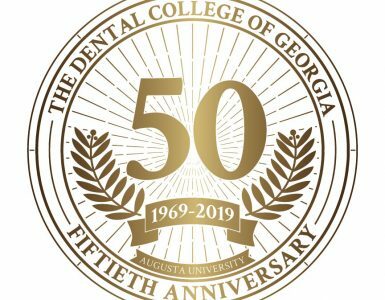 She is a member of the Kappa Delta Pi Educational Honor Society and received the Georgia Dental Association/American Student Dental Association Faculty Award. » Dr. Regina Messer (far right), associate professor in the Department of Oral Biology and Diagnostic Sciences, has been named assistant dean of admissions. She received her engineering science and mechanics degree from the University of Tennessee and her MS and PhD from the University of Alabama at Birmingham, focusing on dental material biocompatibility. Messer joined the faculty in 2000 and serves as graduate program director for oral biology and maxillofacial pathology. She received the 2018 Outstanding Service Faculty Award from The Graduate School of Augusta University. Dr. Tara Schafer, interim chair of the Department of Pediatric Dentistry, has been named to the position permanently. Schafer, who earned her dental degree and a master’s degree in oral biology from the DCG, also completed a DCG certificate program in pediatric dentistry. She is a board certified pediatric dentist. 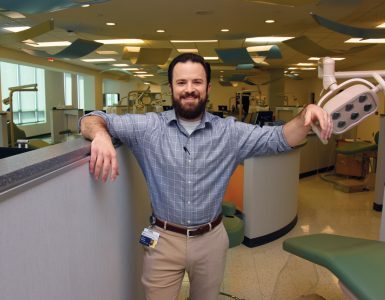 Previously, Schafer served as the director of the predoctoral pediatric dentistry program and director of the Advanced Education Program in Pediatric Dentistry. She is a member of Omicron Kappa Upsilon, the national dental honor society. Special projects during her DCG tenure have included creating videos and programs exposing youths to dental careers and developing interprofessional educational opportunities among health care providers at clerkship sites and medical centers. Dahlia Levine (’18) was recognized as her class valedictorian, a new DCG tradition recognizing the graduating senior with the highest grade point average. Levine also distinguished herself in research and community service, receiving the Delta Dental Student Leadership Award. She served as vice president of her class for four years, tutored in six dental courses, received multiple scholarships and gave research and professional presentations on oral medicine and restorative topics. She is now completing an Advanced Education in General Dentistry residency at Charlie Norwood Veteran’s Hospital in Augusta. For the third year in a row, DCG students accompanied adjunct faculty, dentists and alumni to Hinche, Haiti during a weeklong non AU-affiliated mission trip over spring break. Fourteen of the 40 participants were junior dental students, and three were undergraduates considering dental school. The students worked in the Whitney Clinic at Sacre Coeur and Notre Dame at Kobonal, beginning their volunteer service at dawn each day. They worked one on one with dentists restoring anterior teeth and removing infected teeth. Alex Howell, Class of 2019 and national American Student Dental Association vice president, served as an ASDA delegate to the American Dental Association House of Delegates for the ADA Annual Session, held in October in Hawaii. She represented the interests and welfare of dental students to the ADA and helped develop resolutions regarding dental students and the profession. She also has been appointed the ASDA consultant to the ADA New Dentist Committee. This committee consists of members from across the nation that represent new dentists’ views to the ADA Board of Trustees.